Size of this preview: 400 × 600 pixels. Other resolutions: 160 × 240 pixels | 320 × 480 pixels | 512 × 768 pixels | 682 × 1,024 pixels | 1,800 × 2,700 pixels. This image, originally posted to Flickr, was reviewed on 19 January 2014 by the administrator or reviewer File Upload Bot (Magnus Manske), who confirmed that it was available on Flickr under the stated license on that date. 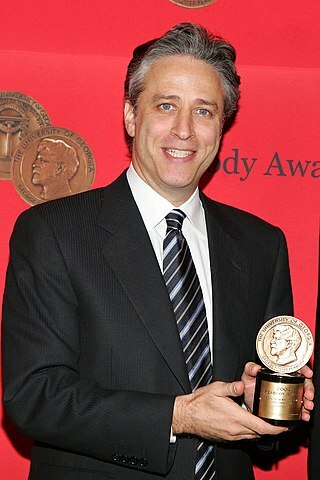 New York, NY - Jon Stewart accepts the prestigious Peabody Award today at the 64th Annual George Foster Peabody Awards ceremony at the Waldorf-Astoria. Comedy CentralÕs ÒThe Daily Show with Jon Stewart: Indecision 2004Ó was one of 32 winners chosen by the University of GeorgiaÕs Grady College of Journalism and Mass Communication as the best in electronic media for 2004.